Fleets drivers often drive repeat routes or routes within the same territory. Coaster can be useful in learning where sudden stop clusters are within those repeat routes and those driving zones. In one fleet vehicle safety study which included sharp braking as a data point, the accident claim frequency of a fleet equipped with telematics devices decreased by almost one third. Current telematics functionality focuses on frequency of sudden stops. Coaster adds to fleet telematics data by tying sudden stops to locations, enabling visualization of stop clusters, enabling driver behavior change or routing adjustments. Individually, the history can be helpful for the regular route driver, a substitute driver for that route, or when onboarding a new driver to that route. At the fleet or sub-fleet level, the drivers’ history can be shared across the fleet in order to provide higher value. The abrupt braking history of all drivers within a “fleet” are shared. More particularly, once a unique “Group ID” is added, abrupt braking events are shared across that fleet. That is to say that the driver’s personal sudden stop event history and those within the fleet are displayed on the map. 1. The fleet administrator would have access to a map showing aggregate data for fleet or subfleet (see the sample below). 2. The fleet administrator may search using different time filters for driving events. Hotspots can be used to alerts drivers other incorporated into other fleet routing applications. 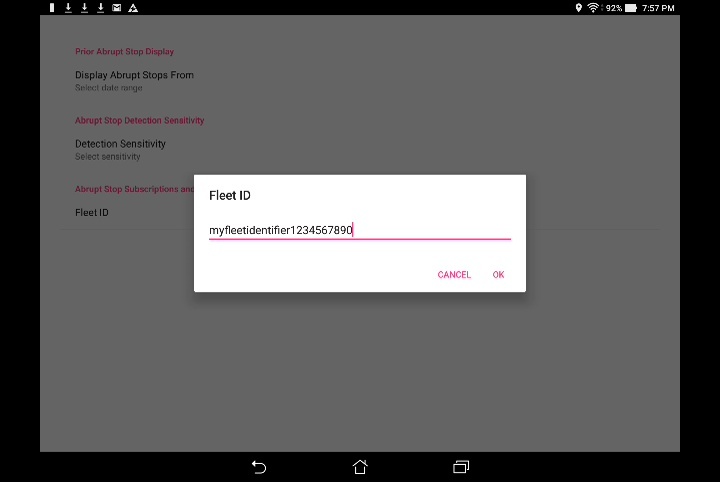 Contact us to participate in the fleet data sharing program or for help using these features.